What does crafting have to do with operations? You’d be surprised! Some of the best gear available in the game is actually craftable, and not just by the highest progression operation groups. This can help you min-max your gear to find the best load out possible. All you need are Black Hole Commendations which are very easy to get nowadays. The daily and weekly quests offer a great way for even the most casual players to be able to do this high end crafting. It’s not a bad way to earn a few credits either. Okay, now that you have some Black Hole commendations you’ll want to buy some Black Hole gear and reverse engineer it. What?? Are you crazy?? You know that saying: Nothing ventured, nothing gained? Well, I’m afraid that applies here. You have to be willing to risk your hard earned gear in order to make the rest of your gear better. Once you learn a mod, you’ll be able to make as many as you want rather than have to wait for Black Hole commendations to come your way. These mods go for quite a high price on the GTN as well so you’ll have an ample source of funding to buy more materials for your crafting. Cybertechs probably get the most benefit from the higher end crafting as they can learn the most things. They have a chance to learn any of the mods that can be found in the Black Hole armor sets in addition to any of the class earpieces. In addition, if you are fortunate enough to be in a group that kills Hard Mode Kephess regularly, then the armoring that can drop from his loot table can also be learned. The armorings found inside the BH peices can be reverse engineered for materials but, unfortunately, those armorings cannot be learned. Artificers enjoy a wide variety of enhancements that can be learned from reverse engineering the piece out of the Black Hole or Campaign piece. There are dozens of schematics to be had as well as the opportunity to learn campaign relics earned from daily commendations. High end hilts can also be learned if you are able to get into Hard Mode Denova and win a main or offhand. Armstechs are a bit limited in what they can learn. Limited means the only thing available is going to be barrels from the Hard Mode Denova weapons. Both Armormechs and Synthweavers are able to learn the Black Hole or Campaign bracers and belt which can be useful for the classes where the orange custom gear isn’t better. As you can see, some professions are more beneficial than others but that doesn’t mean you can only have one useful crafter. 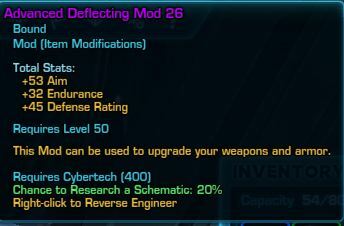 Don’t forget now that you have legacy gear you can, for example, buy a piece of black hole gear on your cybertech and reverse engineer the mod and armoring out of it. After that, stick the enhancement into a legacy piece and send it to your artifice to reverse engineer. 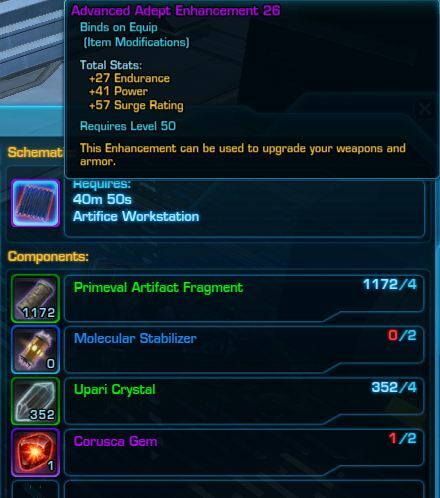 Now that legacy weapons are available with this latest world event going on you can transfer crystals, barrels and hilts as well. You never want to miss a chance to learn a schematic if possible. Sure, that level 26 armoring is nice to fill one slot for a single person, but wouldn’t it be better served if someone learned it and could make them for the rest of the operations group? The opportunity for gear advancement is almost unlimited if a guild worked together to learn as many schematics as they can. In this way, they are able to craft gear for other members, alts and for sale in order to fund their repair bills. Keep that in mind the next time a piece of gear drops and think about how it may be of use to an entire guild rather than a single person.